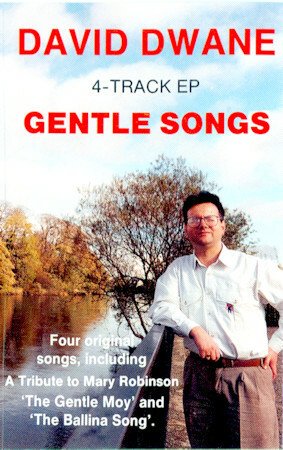 In 1990 David released an EP of his own songs called Gentle Songs featuring Gentle Moy, Ballina Beat, To Mary Robinson, The Old Schoolhouse and Feeling Lonely. Gentle Moy - A song that depicts the final journey of Mayo's largest river, the River Moy, as it meanders through Ballina. The Moy is Ballina's jewel in the crown and a famous salmon fishing river that eventually spills out into Killala Bay, just a few kilometres north of Ballina. David has lived at The Quay, Ballina since 1984, a riverside haven where the River Moy estuary begins. Ballina Beat - This is a nostalgic study of David's adopted town of Ballina, Co. Mayo. It looks back over changes to the town's landscape between David leaving his hometown of Ballyhaunis as a teenager in 1974 to start his working life in Bank of Ireland in Ballina, to the release of the song in 1990. To Mary Robinson - 1990 was not only the beginning of an economic boom in Ireland, but also a landmark year in its social history. Ballina native Mary Robinson became Ireland's first woman President. As an academic and politician Mary Robinson had previously worked to liberalise some of our more conservative laws and move away from the insular mindset of a society heavily dominated by the Catholic church. Her election to the highest office in the country symbolised the many changes sweeping Ireland, most of these for the better. Later Mary Robinson became the United Nations High Commissioner for Human Rights. Feeling Lonely - A personal love song for David's wife, Harriett. The Old Schoolhouse - David's reminiscences from his days in Ballyhaunis National School, Abbeyquarter in the mid- 1960's. The school was demolished in the 1980's and replaced by a more modern building. In fact the school where David attended secondary school at Knock Road Ballyhaunis - St. Patrick's College - was also demolished around the same time to make way for a new Community School. Backing Vocals: Gabrielle Gardiner; Joe Ryan; The Quay National School pupils including Stephen Lennon, Pamela Lacken and Lavinia Heneghan.